If you want to get a Squishee or a Lard Lad Donut, all you need to do is head to Myrtle Beach, South Carolina. For years, these items have merely been something that those who watch The Simpsons could dream of actually getting for themselves. 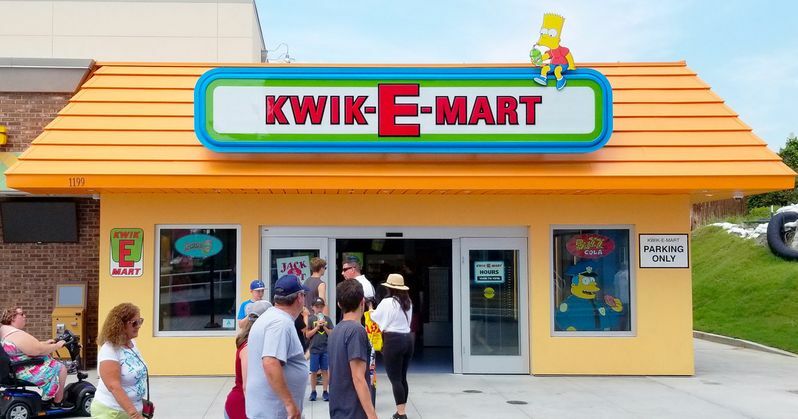 That dream has finally become a reality, as the first ever permanent Kwik-E-Mart location has opened. It comes complete with plenty of treats from the world of the long-running animated sitcom. Apu is even present, to give it a truly authentic feel. The store opened recently at Broadway at the Beach in South Carolina. It may have taken 30 years to make it happen, but the Kwik-E-Mart has moved from fiction to reality with the opening of this new attraction. Mark Cornell, senior vice president of attractions development for SimEx-Iwerks Entertainment, had this to say about the new store ripped straight from Springfield. "Broadway at the Beach is like no other location. It really draws a lot of foot traffic walking around and I really think that it's the perfect first place. I think the Simpsons would come to Myrtle Beach for a vacation." Aside from the Squishees and Lard Lad Donuts, the store also features a ton of Simpsons memorabilia and Duff branded energy drinks. Characters from the show line the walls and the outside of the store looks amazingly authentic. Truth be told, the inside of the store doesn't look much like what fans will be familiar with, but there's still a charm to it. Apu is synonymous with the Kwik-E-Mart, as the store's loyal owner and operator, voiced by Hank Azaria. However, the character has been subject to controversy as of late, ever since the documentary The Problem With Apu aired. The documentary calls into question the stereotypical representation of Indians in America, not to mention the fact that the convenience store clerk is voiced by a white man. Despite that, it's tough to imagine opening such a place and not including Apu in it. Mark Cornell says one of the best parts of opening the store so far has been seeing the different generations of fans that have been enjoying it. "A 64-year-old grandmother, her son and daughter-in-law, and their three children. They were all sort of arguing about who were stronger fans, but to see three generations walk through the door that all love The Simpsons, how can you say that about anything else?" This comes not long before The Simpsons landmark 30th season is set to make its debut on Fox next month. Will this lead to an actual Kwik-E-Mart chain that spreads across the country? If not, it makes for a good excuse to visit Myrtle Beach. You can check out some photos from the store, as well as a video tour of the location, for yourself below. This news comes to us courtesy of WBTW.